The H4TF Rewards Club has four levels. Each level has been carefully selected to represent and honour the different stages that you go through when embarking on a new lifestyle. I believe that taking the first step to change and pushing ourselves out of our comfort zone, is a super brave step to take and one that takes mindfulness and tenacity. So why shouldn’t you celebrate and be rewarded for all of your good work. No matter how big or small the steps are, you are moving forward and that’s what matters. Progress over perfection every time! 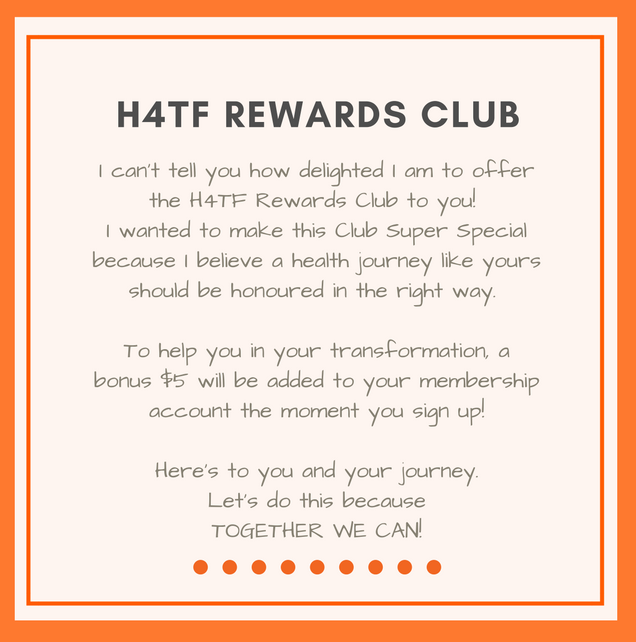 By belonging to the H4TF Rewards Club, you will be provided with all of the support you need to empower yourself to a life of good health and wellbeing. I’ll be there to help nurture you every step of the way and answer any holistic health questions you may have. Let’s be truthful, there will be times when you will be totally lost, lose enthusiasm, feel like it’s all too hard, and not know how to move forward. That’s where I will step in to help you see it through! 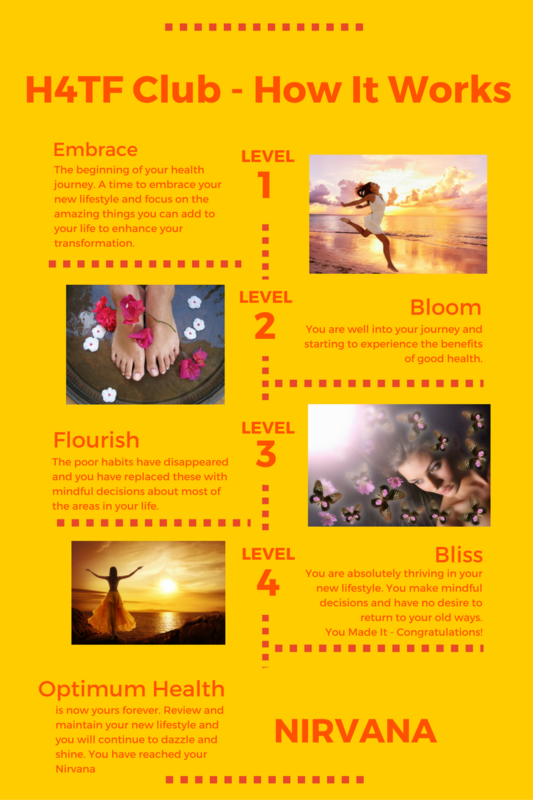 So, What Are The Four Levels and How Do You Achieve Them? This is the beginning of your health journey. A time to embrace your new lifestyle and focus on the amazing things you can add to your life to enhance your transformation. Honour yourself for taking this brave step towards empowerment and joining the Health Revolution! You are well into your journey and beginning to experience the benefits of good health and the changes you have introduced. Like a beautiful flower in spring, you are beginning to bloom in this new, wonderful lifestyle you have created. The poor habits have disappeared and you have replaced these with mindful decisions about most of the areas in your life. You are now flourishing in your new lifestyle! You are absolutely thriving in your new lifestyle. You make mindful decisions and have no desire to ever return to your old ways. You Made It – Congratulations, You Are Amazing! Optimum Health is now yours forever. Review and maintain your new lifestyle and you will continue to dazzle and shine. You have reached your Nirvana!